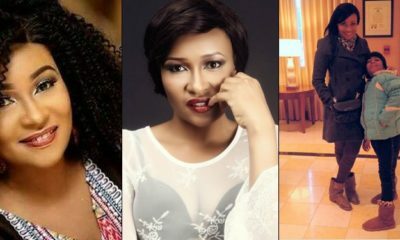 Nollywood Actress, Doris Simeone has revealed why single motherhood isn’t the fault of women who find themselves in such, and according to her, she and her ex-husband, Daniel Ademinokan are not legally divorced. She made this known in an interview with ThisDay, where she explained why such lifestyle is now fashionable among Nollywood Actresses. What’s your marital status now? I am not legally divorced – the divorce suit is still in court. Yes, I am single and I am a happy woman. Don’t you think being a single mother is now fashionable in Nollywood? Single motherhood is not peculiar to Nollywood. If you go to the banking sector, there are single mothers there; in the military, in law firms and other fields, there are single mothers. It is not our fault; it’s just that men no longer want to play their role as husbands. I am not a supporter of single parenthood: every man or woman has the right to live their life the way they choose. It’s just by God’s grace that I am acting and producing. Emotional trauma is not what I will encourage anybody to pass through. God created every woman for a man. So marriage is good. Is there any possibility that you and your ex will reconcile? I don’t dwell in the past. I don’t want to talk about that anymore. I have moved on. I have no regret at all. I have only learnt to be stronger. The truth is that I have forgotten about everything. Time has erased it (the emotional pain I went through). I am now a better person. Today, I am closer to God and I put God first in everything I do. I never gave up on love. I have found love again in Jesus. I am married to my career right now. I am in a relationship anyway but I want to be private about it. I thank God because I am a better person. My career and business are going on well. I am single and ready to mingle. If God sends a man to me I will not reject him. I am not bored. If it’s God’s plan for me I will go ahead (and get married); if not, then I will remain single. Do you still have a good relationship with your ex-husband and his wife? It’s my patience. I am also playful. I am playful to the extent that a lot of people think I am not a serious person. I am a very funny person.